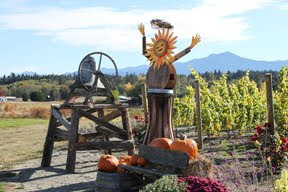 Last year all of the wineries on the Peninsula created Scarecrows out of wine barrels. Olympic Cellars' creation was inspired by my love of sun flowers and the desire to have a watchful "angel" over our La Petite Vineyard. I can tell you we had a pretty good laugh when our scarecrow was completely assembled and in the ground. Molly said she had quite a "bootie" and I thought she looked vaguely like a "telly tubbie". Our Angel braved the frigid winter and (believe it or not) the heat wave of summer. Guess we should have watered her or at least given her a few glasses of wine... because alas she began to shrink, her "oak" was drying out! Her face was cracking and her body was literally falling out of her metal barrel staves. Libby came to the rescue to give our angel a facelift (we had to decapitate her first). Then metal artists John and Cynthia Dash took her aging barrel body back to their studio and breathed in new life with a whole new sinewy shape. 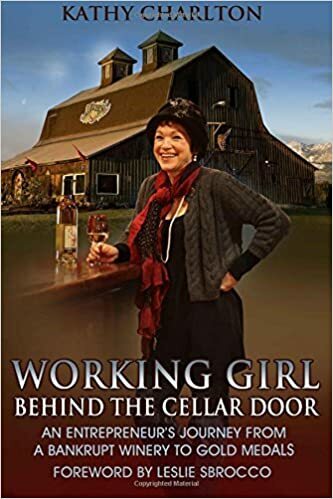 Her hand is even on a spring... she greets winery guests with the perfect Beauty Queen wave. And her loose barrel stave skirt actually blows in the wind scaring off pesky grape eating birds. It was a late Friday afternoon when she was installed. All of us were exhausted after crushing grapes all day and a bit slap happy. So when someone mentioned that the upper torso was a "bit flat" and needed some embellishment, you can only imagine the topic. To stay authentic it was suggested that we use the "punts" cut from a very large wine bottles and attach them it to her chest. (The punt is the concave portion at the bottom of a wine bottle.) Bottle sizes suggested were called Jeroboam (3L) and Methuselah (6L) which are way bigger than a magnum. I learned something new but don't know if I'm going that far!